Kitchen was adequate with plenty of crockery, cutlery, glasses, etc. Quite roomy. Very good location in Kingston. Real Estate people were very helpful. Good location to cafes, parking easily accessible. Good location but unfortunately a number of restaurants closed because of noise level due to building works in Kingston. Convenient to the train station and lots of restaurants. Easy to get to main tourist attractions. Good location, nicely furnished. Generally clean and good facilities. The apartment itself was comfortable and accommodated all six adults and one baby quite well. Kitchen was excellent! Lounge was comfy and roomy. Overall was a roomy apartment which was clean, tidy & well presented. Very comfortable bed; walking distance to shops and cafes/restaurants etc. Easy access parking; late arrival was no problem. The location was very good. Right in the centre of Kingston. Easy walking distance to restaurants, supermarket, bottle shop etc. Excellent range of coffee and tea mugs and good wine glasses. Towels were excellent. One of our top picks in Canberra.Accommodate Canberra - Griffin Kingston Central Apartments is located just 1,000 feet from Kingston Mall. All accommodations offers a balcony and a fully equipped kitchen. Guests enjoy an onsite fitness center and free parking. Manuka Oval is 2,300 feet from Accommodate Canberra - Griffin Kingston Central Apartments, while Manuka Shopping Area is 2,650 feet away. The nearest airport is Canberra International Airport, 3.1 mi from the property. All apartments offer a lounge area with a desk, a flat-screen TV and a DVD player. All apartments include laundry facilities and a private bathroom with a shower and hairdryer. Towels and bed linen are provided. When would you like to stay at Accommodate Canberra - Griffin Kingston Central Apartments? This air-conditioned apartment features a fully equipped kitchen. This apartment is located on the top floor and is accessible by stairs only. This apartment is located on Level P and is accessible by stairs only. This air-conditioned apartment features a balcony, a fully equipped kitchen and laundry facilities. This apartment is located on Level 1 and is accessible by stairs only. This executive standard apartments are located in the heart of Kingston and boast a host of quality features of 5 star hotel standards. A very short stroll will take you to a huge range of restaurants and cafes. Secure car parking is included, as well as the gym located in the complex The Griffin Apartments are located within walking distance to Kingston conveniences and renowned dining options, the tourist award winning “Old Bus Depot Markets' along with Canberra Glass Works and the Burley Griffin Antique Centre. Less than five minutes’ drive away is the impressive Manuka shopping precinct and Manuka Oval as well as many of the national capital’s most popular tourist attractions. 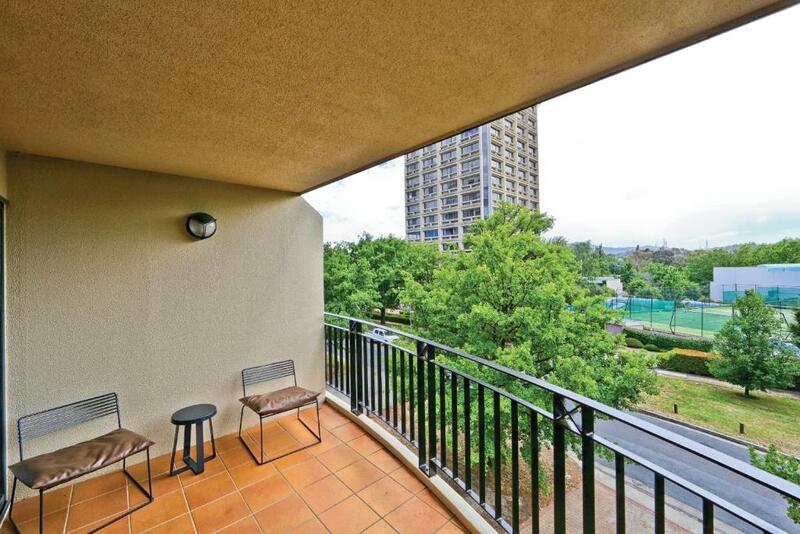 Experience the difference with an Accommodate Canberra apartment…. WiFi is available in public areas and costs AUD 20 per 24 hours. House Rules Accommodate Canberra - Griffin Kingston Central Apartments takes special requests – add in the next step! Accommodate Canberra - Griffin Kingston Central Apartments accepts these cards and reserves the right to temporarily hold an amount prior to arrival. Please note that keys must be collected from the central reception desk within the Maloney’s Real Estate office, at the corner of Giles and Jardine Street, Kingston. Closed on Saturday, Sundays and public holidays. Please inform Accommodate Canberra - Griffin Kingston Central Apartments of your expected arrival time in advance. You can use the Special Requests box when booking, or contact the property directly using the contact details in your confirmation. It was up 3 flights of stairs. I may have missed this detail in listing (?) but would have been good to know. Too many stairs esp with luggage. No glass shelf, just frame in shower. Carpet has loose ripples & needs restretching. Bed too low and hard to get in and out. Stairwell foyer door closer not working all time and door left open, therefore security compromised. More soap to wash hands. Television remote doesn't work without very hard pressure. Dirty mop lying on balcony. Space between bed and cupboard too narrow, especially hard to walk safely getting up during the night. Apartment was on level 3 with no lift available. Stairs very grubby and the complex looked tired. Parking was not easy to negotiate due to the small parking spaces available for the apartments. The vacuum cleaner provided with the apartment was stuck so I fixed it. The air conditioner's filter was dirty so I cleaned it and it worked much better. Maybe they should have given me a discount for the work I did - I think I left the apartment cleaner than when I checked in ! Also, the TV only receives SD channels, all the HD channels had no video. On booking the apartment I was not informed that it was located on the 3rd level of the building and that there was no lift. My father in-law is 94 years of age and he found it most difficult to climb the 6 flights of stairs to the apartment. Also there was a light not working on the first level stairwell and this is a real OH&S issue. The fan is the en-suite did not work and the lock on the main bathroom door was broken. We reported this and a repair person was sent directly to try and fix it but unfortunately the lock was unable to be fixed properly. We weren’t provided with a swipe key for the bin room, there was no aircon in the bedrooms. No air conditioning in bed rooms, broken facilities, equipment, no lift. Cheap common areas. No air conditioning in the bedroom. Televisions weren’t tuned. No reception to assist. Our Unit 116 was not air-conditioned in the bedrooms which was awkward in a heat wave. Many maintenance issues which could be easily fixed but weren't. They did however quickly repair the toilet seat which had completely come off the pedestal. No shelf for soap/shampoo in both showers, door off the laundry tub cabinet, handles loose on both bathroom doors. Bathrooms need a really good clean. Pillows too soft and didn't give support. There are no markings on the stove so had to guess which was high and low. 7 flights of stairs to reach our apartment which we were not aware of at the time of booking. Beds were a bit too soft and bathroom door didn’t shut properly. Nice apartment and perfect for my family.